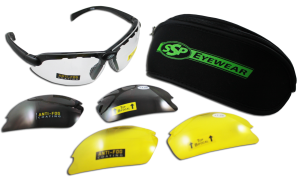 I stumbled across this innovative eye protection at the 2018 SHOT Show in Las Vegas in the SSP Eyewear Booth. 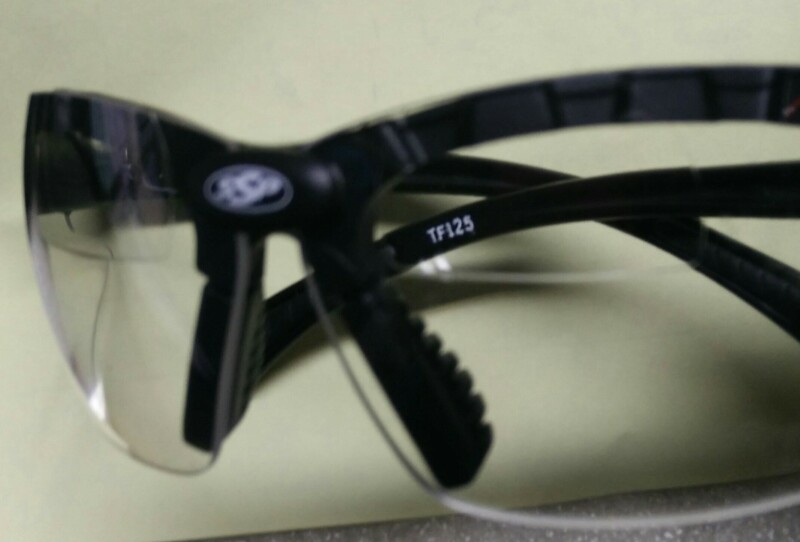 What a brilliant idea-safety glasses with a magnification at the top of the lens which they call "Top Focal" instead of at the bottom like a bi-focal. What a good idea! It actually made me stop my normal foraging for free trade show samples and try these glasses on and talk with the factory reps. I am well aware of the issues older shooters have with their eyes, and how the perfect sharp front sight focus and ghosted rear sight is long gone-somewhere above age 40. Fuzzy front sight, fuzzy rearrsight and fuzzy target can be the new-sight picture especially with pistol shooters.I have attended some Guns Save Life meetings and my tired old eyes have observed some other older eyes in attendence who may get a big shooting boost out of these new specs. Working as a law enforcement firearms instructor for a few decades, I saw the problems older eyes brought to the pistol qualification range dates. I would offer a few work around solutions-which might have cost actual out of pocket money, training or effort, but most of my suggestions were ignored. Old guys just continuing to semi-blindly shoot into the middle of the large Andre the Giant sized targets and hope to meet minimum qualification scores. When I saw some $15-$20 bottom bi-focal safety glasses at Home Depot I passed it along to older shooters in my agency, and a lot of them showed up on range day hoping to see their sights once again. The problem, was they did not normally wear bi-focal glasses, and found they had to tip their head far back to get the lens to pick up the sights-a very unusual position and fairly awkward. I don't think I ever saw those bottom bi-focal safety glasses show up at the range twice. These new SSP Top Focal glasses put the lens along the top edge and it made instinctual sense to me that when I extend a pistol-I tip my head forward a bit naturally. I do the same thing wearing readers at the computer and when looking away I tip my head down to look over the readers to avoid distortion. With these glasses, the front sight was crystal clear and rear sight was also quite good-inside the brightly lit trade show hall. They are high quality impact rated safety glasses with excellent clarity on both top and bottom. The curved lens covers the entire eye orb-much safer than trying to get away with using a pair of reading glasses on the range (yeah I've see it.). I wear readers/cheaters for computer work and reading with a slight 1.25 magnification and the rep said to just get the SSP Top Focal glasses in the same magnification. After fawning over the new product for a while and failing to elicit a free sample, when I got home I ordered up a Top Focal Kit from SSP which included a zippered carrying case, one frame, and three sets of Top Focal lenses in clear, yellow and smoke for about $40. This week, I took them to an indoor range and an outdoor Glock GSSF match to see how they would work in real life.The magnified portion is much smaller than I remember, about the size of the tip of my little finger. Yet when you wear them, looking through the lens it seems the maginification takes up half the glass. Top Focal Simulator-taking a picture through the magnified part of the lens-shows how sharp the sights can be. I was particularly interested in using these lenses with indoor range use. Bad booth lighting is awful for obtaining a good sight picture. Fiber optics don't work in those situations because there isn't enough light to make the tubes glow, and night sights are OK, but I would really prefer to focus on my sight alignment than chasing glowing dots.I have shot a lot of indoor rapid fire competition and am not sure I have ever conciously seen my night sights when I am shooting in a hurry. I love looking over in the night and seeing night sights glowing on a night stand, but in a self defense situation I will be looking across my front sight at a target with much more intensity than getting those dots to align properly in the dark. I went into a range which is only about two years old and it had pretty good lighting and good air throughout. 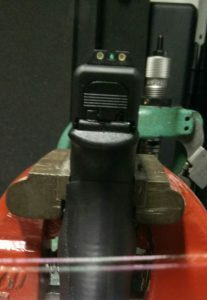 The short story here, is the SSP glasses were a huge inprovement in my being able to see my pistol sights quite clearly. I had some color gradiant human outline targets which are just general outlines (try to color inside the lines at all times) and did not have dark circles or designated aiming points. At 25 yards, the target center was a blur in the Top Focal lens as expected. I could focus hard on seeing my sights and having proper sight alignment and trigger pull and not worrying too much about the target. If I did my part on the trigger end, the bullets will fly down and hit the middle of the target. I do regret not taking some bullseye targets as I think these glasses would excell on those targets. At the end of the pistol session, I pulled the targets in to 7 yards and specifically focused with the lenses and aimed at a small logo in the corner-and shot a thumb sized chunk out of the paper with 10 overlapping rapid rounds. I was impresssed. There was quite a bit of good mechanics involved, but I was actively seeing those sights as a major part of the success. I had a couple of new carbines along that day and shot red dot sights and pop-up Magpul AR peep/post sights using the SSP eyewear. Not being a bi-focal wearer I was not too keen on moving around the range with the glasses on, but quickly learned to tip my head up or down as necessary. I was able to use the magnifying lens with great success to adjust the tiny change marks on the red dot Up/Down and R/L turrets. Shooting with full cheek weld through the red dot scope I found I did not care for the magnified lens and would push the glasses up my nose a bit and shoot through the lower non-magnified portion instead of tipping my head back. I was thus able to dial in my co-witness Magpul pop up sights while looking through the red dot scope and get the other Vortex red dot adjusted without using the Top Focal part of the lens. A couple of days later I went to an all Glock shoot put on by the Glock Shooting Sports Foundation (GSSF) and took the SSP Top Focals along with some regular shooting glasses. I really don't need the magnification for outdoor pistol shooting, but committed to try and spend the afternoon wearing the Top Focals and shoot the easy stages which do not require running and gunning. Not being a bi-focal wearer, it would be a challenge for me personally to move around quickly with these glasses on while working out which end of the lens to look through, but I did spend the day with them on and found I looked through the top part most of the time and could see quite well in the pistol bays. The 15-25 yard targets were blurry, but they used tombstone shaped brown cardboard targets with some perforations designating scoring rings, and with or without glasses I don't see the rings beyond about 10 yards any way. Using the Top Focals I was amazed to see how clear the sights and 7-10 yard targets were, and I shot quite well with a higher number of center hits than ususal. I also used the lenses on falling plate racks with some pretty good success. Starting from a ready pistol position, you engage six steel plates about 12 yards away and knocked down all six plates in five seconds-as quick as I would hit six plates with regular safety glasses. I was impressed. These lenses definately have a place for older eyes. With baby boomers getting older and older, many of us have embraced the Dollar Store reader specs to get by on the cheap-it may be time to embrace these SSP Top Focals to get back some of your youthful crisp sight picture as well. This entry was posted on September 30, 2018 at 8:05 pm and is filed under Blog. You can follow any responses to this entry through the RSS 2.0 feed. Thank you sir. Remarkable products at a great price.